Hannah and Her Sisters is a 1986 American comedy-drama film which tells the intertwined stories of an extended family over two years that begins and ends with a family Thanksgiving dinner. The film was written and directed by Woody Allen, who stars along with Mia Farrow as Hannah, Michael Caine as her husband, and Barbara Hershey and Dianne Wiest as her sisters. The film's ensemble cast also includes Carrie Fisher, Farrow's mother Maureen O'Sullivan, Lloyd Nolan (who died in September 1985, more than four months before the film's release), Max von Sydow and Julie Kavner. Daniel Stern, Richard Jenkins, Fred Melamed, Lewis Black, Joanna Gleason, John Turturro, and Julia Louis-Dreyfus all have minor roles, while Tony Roberts and Sam Waterston make uncredited cameo appearances. Several of Farrow's children, including a pre-adolescent Soon-Yi Previn (who married Allen in 1997), have credited and uncredited roles, mostly as Thanksgiving extras. Hannah and Her Sisters was for a long time Allen's biggest box office hit (forgoing adjustment for inflation), with a North American gross of US$40 million. The film won Academy Awards for Best Original Screenplay and for Best Supporting Actor and Best Supporting Actress. Today, Hannah and Her Sisters is widely regarded as one of Allen's finest works. Critics continue to praise its acting, screenplay, and direction. Elliot becomes infatuated with one of Hannah's sisters, Lee (Barbara Hershey), and eventually begins an affair with her. Elliot attributes his behavior to his discontent with his wife's self-sufficiency and resentment of her emotional strength. Lee has lived for five years with a reclusive artist, Frederick (Max von Sydow), who is much older. She finds her relationship with Frederick no longer intellectually or sexually stimulating, in spite of (or maybe because of) Frederick's professed interest in continuing to teach her. She leaves Frederick after he discovers her affair with Elliot. For the remainder of the year between the first and second Thanksgiving gatherings, Elliot and Lee carry on their affair despite Elliot's inability to end his marriage to Hannah. Lee finally ends the affair during the second Thanksgiving, explaining that she is finished waiting for him to commit and that she has started dating someone else. Hannah's ex-husband Mickey (Woody Allen), a television writer, is present mostly in scenes outside of the primary story. Flashbacks reveal that his marriage to Hannah fell apart after they were unable to have children because of his infertility. However, they had twins who are not biologically his, before divorcing. He also went on a disastrous date with Hannah's sister Holly (Dianne Wiest) when they were set up after the divorce. A hypochondriac, he goes to his doctor complaining of hearing loss, and is frightened by the possibility that it might be a brain tumor. When tests prove that he is perfectly healthy, he is initially overjoyed, but then despairs that his life is meaningless. His existential crisis leads to unsatisfying experiments with religious conversion to Catholicism and an interest in Krishna Consciousness. Ultimately, an unsuccessful suicide attempt leads him to find meaning in his life after unexpectedly viewing the Marx Brothers' Duck Soup in a movie theater. The revelation that life should be enjoyed, rather than understood, helps to prepare him for a second date with Holly, which this time blossoms into love. Holly's story is the film's third main arc. A former cocaine addict, she is an unsuccessful actress who cannot settle on a career. After borrowing money from Hannah, she starts a catering business with April (Carrie Fisher), a friend and fellow actress. Holly and April end up as rivals in auditions for parts in Broadway musicals, as well as for the affections of an architect (Sam Waterston). Holly abandons the catering business after the romance with the architect fails and decides to try her hand at writing. The career change forces her once again to borrow money from Hannah, a dependency that Holly resents. She writes a script inspired by Hannah and Elliot, which greatly upsets Hannah. It is suggested that much of the script involved personal details of Hannah and Elliot's marriage that had been conveyed to Holly through Lee (having been transmitted first from Elliot). Although this threatens to expose the affair between Elliot and Lee, Elliot soon disavows disclosing any such details. Holly sets aside her script, and instead writes a story inspired by her own life, which Mickey reads and admires greatly, vowing to help her get it produced and leading to their second date. A minor arc in the film tells part of the story of Norma (Maureen O'Sullivan) and Evan (Lloyd Nolan). They are the parents of Hannah and her two sisters, and still have acting careers of their own. Their own tumultuous marriage revolves around Norma's alcoholism and alleged affairs, but the long-term bond between them is evident in Evan's flirtatious anecdotes about Norma while playing piano at the Thanksgiving gatherings. By the time of the film's third Thanksgiving, Lee has married someone she met while taking classes at Columbia, while Hannah and Elliot have reconciled their marriage. The film's final shot reveals that Holly is married to Mickey and that she is pregnant. Part of the film's structure and background is borrowed from Ingmar Bergman's Fanny and Alexander. In both films, a large theatrical family gather for three successive year's celebrations (Thanksgiving in Allen's film, Christmas in Bergman's). The first of each gathering is in a time of contentment, the second in a time of trouble, and the third showing what happens after the resolution of the troubles. The sudden appearance of Mickey's reflection behind Holly's in the closing scene also parallels the apparition behind Alexander of the Bishop's ghost. Additional parallels can be found with Luchino Visconti's 1960 film Rocco and His Brothers, which, besides the connection to its name, also uses the structural device of dividing sections of the film for the different siblings' plot arcs. The movie was satirized in Mad magazine as "Henna and Her Sickos." The film was originally about a man who fell in love with his wife's sister. Then Woody Allen re-read the novel Anna Karenina "and I thought, it's interesting how this guy gets the various stories going, cutting from one story to another. I loved the idea of experimenting with that." He was particularly intrigued by the character of Nicholas Levin "who can't seem to find any meaning to life, he's terribly afraid of dying. It struck home very deeply. I thought it would be interesting to do one story about the relationship between three sisters and one story about someone else and his obsession with mortality." Allen admits the role of Hannah was based on Farrow being "a romanticised perception of Mia. She's very stable, she has eight children now, and she's able to run her career and have good relationships with her sister and her mother. I'm very impressed with those qualities and I thought if she had two unstable sisters it would be interesting." Allen says he was also inspired by the title. "I thought I'd like to make a film called Hannah and Her Sisters," he said, saying this prompted him to give Hannah two sisters. He was interested in making something about the relationship between sisters which he felt more complex than that between brothers. "Maybe that comes from childhood; my mother had seven sisters and their children were female so all I knew were aunts and female cousins." Mia Farrow later wrote that Allen had been intrigued about the subject of sisters for a long time. His earlier co-stars Janet Margolin had two sisters, and Diane Keaton had two, and Farrow had three. She says Allen gave her an early copy of Hannah and Her Sisters saying she could play whatever sister she wanted, but that "he felt I should be Hannah, the more complex and enigmatic of the sisters... whose stillness and internal strength he likened to the quality Al Pacino projected in The Godfather." Farrow wrote that "It was the first time I criticised one of his scripts. To me, the characters seemed self-indulgent and dissolute in predictable ways. The script was wordy but it said nothing." She claims "Woody didn't disagree and tried to switch over to" an alternative idea "but preproduction was already in progress and we had to proceed." It was my mother's stunned, chill reaction to the script that enabled me to see how he had taken many of the personal circumstances and themes of our lives, and, it seemed, had distorted them into cartoonish characterisations. At the same time he was my partner. I loved him. I could trust him with my life. And he was a writer: this is what writers do. All grist for the mill. Relatives have always grumbled. He had taken the ordinary stuff of our lives and lifted it into art. We were honored and outraged. Farrow admitted "a small sick feeling... deep inside me" which "I shared with nobody was my fear that Hannah and Her Sisters had openly and clearly spelled out his feelings for my sister. But this was fiction, I told myself... So I put those thoughts out of my mind." 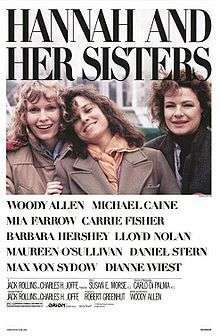 Hannah and Her Sisters opened on February 7, 1986 in 54 theatres, where it gained a stellar $1,265,826 ($23,441 per screen) in its opening weekend. When it expanded to 761 theatres on March 14, it garnered a respectable $2,707,966 ($3,809 per screen). it went on to gross $40,084,041 in the US (including a re-release the following year), and remains one of the highest-grossing Woody Allen movies. Adjusted for inflation it falls behind Annie Hall (1977) and Manhattan (1979), and possibly also one or two of his early comedies. Midnight in Paris (2011) surpassed its box office as well. The film was screened out of competition at the 1986 Cannes Film Festival. Hannah and Her Sisters has a 'fresh' 93% Rotten Tomatoes rating and an average score of 8.5/10 based on the reviews of 54 critics. It also has a 90/100 weighted average score on Metacritic, which translates to "universal acclaim". The film received seven Academy Award nominations including Best Picture. Woody Allen received two Academy Award nominations, winning one for Best Screenplay, Original and he earned a nomination for Best Director. His work on the film was also recognized with two BAFTA Awards. Michael Caine and Dianne Wiest won Academy Awards for Best Supporting Actor and Best Supporting Actress, for their portrayals of Elliot and Holly, respectively. Hannah and Her Sisters was the last film to win in both supporting acting categories until The Fighter in 2011. The film was also Oscar-nominated for Best Art Direction-Set Decoration and Best Film Editing. Allen received the 1986 award for Best Director from the U.S. National Board of Review of Motion Pictures, Dianne Wiest won Best Supporting Actress, and the film was nominated for Best Film. In France, the film was nominated for a César Award for Best Foreign Film. Critics Siskel and Ebert each rated the film among the top three of the 1986 film year; Roger Ebert's 1986 review of the film called it "the best movie [Woody Allen] has ever made." Vincent Canby, of the New York Times, gave the film a highly favorable review, going as far as to say that it "sets new standards for Mr. Allen as well as for all American movie makers." The American Film Institute nominated the film for a ranking on its 1997 lists of the 100 greatest American movies, the 100 funniest movies, and the 100 greatest love stories. In 2005, the Writers Guild of America named Allen's script the 95th best movie screenplay ever written. In October 2013, the film was voted by the Guardian readers as the fourth best film directed by Woody Allen. ↑ Canby, Vincent (1986-02-07). "FILM: FROM WOODY ALLEN, 'HANNAH AND HER SISTERS'". The New York Times. ↑ Schneider, Dan (2012). "Rocco And His Brothers". The Spinning Image. Retrieved April 10, 2014. ↑ "Mad #265: September 1986". Retrieved November 25, 2015. 1 2 3 4 5 AUTEUR! AUTEUR! By Caryn James. New York Times (1923-Current file) [New York, N.Y] 19 Jan 1986: SM18. ↑ "Hannah and Her Sisters (1986)". Boxofficemojo.com. Retrieved 2012-09-18. ↑ "Festival de Cannes: Hannah and Her Sisters". festival-cannes.com. Retrieved 2009-07-18. ↑ Ebert, Roger. "Hannah and her Sister". RogerEbert.com. Retrieved 15 August 2015. ↑ Vincent Canby (February 7, 1986). "Film: From Woody Allen, 'Hannah And Her Sisters'". The New York Times. ↑ "101 Greatest Screenplays List". Retrieved November 25, 2015. ↑ "The 10 best Woody Allen films". The Guardian. October 4, 2013. Retrieved November 22, 2014.